For this week’s article, I’m going to break down the rookies into 1st/2nd/3rd teams based on their performances over roughly the first third of the season. This is solely my own opinion, mostly based on statistical performance but also some other intangibles thrown in there. Feel free to drop your own teams in the comments! Let’s go! If you think there was a changing of the guard in Cleveland, then you forgot about the Spurs’ offseason. This is a team whose slogan should be “out with the old, in with the new.” Losing one of the best players in the NBA is hard, but gaining youth while maintaining veteran leadership is impressive. What makes the Popovich era so great in San Antonio is his ability to rebuild while contending and, while last year was a down year, I think things pick up quite nicely for the Spurs in 2018-19. Now for the fantasy spin on this years Spurs squad. It’s fitting that my rookie contribution to Razzball would be focused on this year’s rookie crop. I may tend to start off posts with a heavy Kevin-centric focus. I’ve been obsessed with Fantasy NBA for 15 years. Have I won chips? More than zero. Are my fantasy prognostications correct? Ride with me for a solid 50/50 shot at accuracy. What about real basketball? Was I a scrappy D3 player that really understands the game? I’m on the bottom half of bad pickup games, but I can dunk on an 8-foot rim. So yeah, you could call me an expert. Let’s begin! The promise, upside, and mystery of rookies entice us Fantasy GMs every season. Yet there is statistical history that proves love, like Jon Arbuckle for Veterinarian Liz, generally goes unrequited. Last season there was a boon in productive rookies, with 8 being standard league relevant (12 team, 13 player roster): Ben Simmons (27), Donovan Mitchell (39), Jayson Tatum (42), Lauri Markkanen (66), Lonzo Ball (78), John Collins (92), Kyle Kuzma (116), Jarret Allen (143). 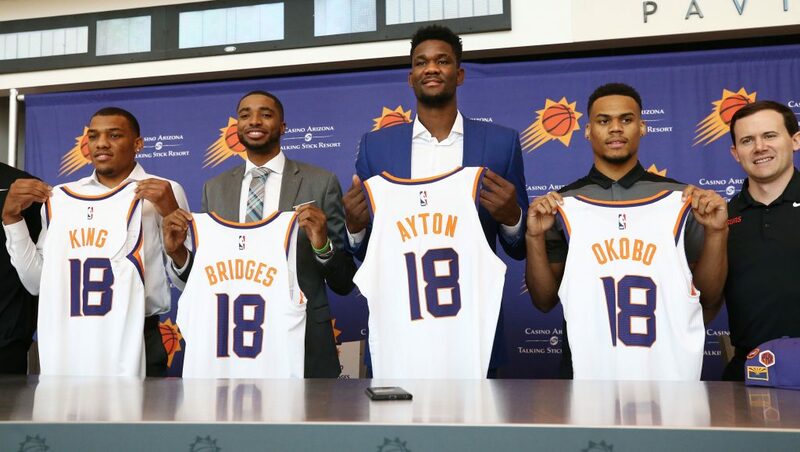 While that rookie class surpassed the hype, what’s in store for this year’s group? These youngsters carry a lot of weight in dynasty leagues, but for the purposes of this article, we will focus on standard redraft leagues. For a deep dive in terms of dynasty, check Craig’s rankings here and here. 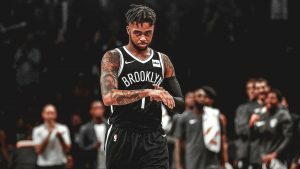 Here we are Razzball Nation, deep in the hole of the NBA offseason when many a free agent chips fell, the NBA draft came and went, and the Summer League, where the stars of the future showcased their talents, concluded. In true Dynasty Deep Dive fashion, I shall leave the free agent signings for my colleagues to cover, but deliver the final edition of the Dynasty Deep Dive rookie rankings so you can ponder and utilize for your upcoming dynasty rookie drafts. Be aware that these are my opinions and not indicative of anyone else at Razzball. Also, these rankings should be viewed through a long-term prism, as they are for the totality of a player’s career. Do not use for redraft leagues. The rankings have been broken down into four parts and will be published accordingly. Who wants to read through a 12,000 word essay in one sitting? We do this for fun right? So let’s get on with the show and enjoy my Top 15. I’ve been on hiatus, probably since about a month to go in the 2017-18 season. I blame myself, and my schedule, for not being loyal to my readers. My league had ended, as I ranted about in my last piece, but yours probably didn’t. For those looking for the league winners I had been providing throughout the season, I apologize. For those who are reading my column for the first time ever here in July, I applaud and welcome you to Beyond the Glory. For those who don’t remember, I was literally two game 7 wins away from being the only Razzball writer to have the Rockets and Celtics in the finals, and then I got neither. I would have basked in that glory for at least a year, but being bold only brought me close to brilliance. Either way, I am back and will be knocking out more content in the offseason, before going back to weekly columns for your reading pleasure. Oh, the offseason. The start of the NBA season is many months away, yet something inside of me is far too excited for fantasy basketball. Call it what you will. We are the midst of the baseball season and fantasy football prep has begun in earnest. With all of this going on, though, I come home at night and turn on the NBA Summer League. I don’t know why, but my remote leads me there. The only reasonable explanation is that I am pumped for the new draft class. I am pumped to see free agent signings and I am pumped for LeB… I promised myself I wouldn’t go there. I am going to hold strong, because in truth, I’m not excited for anything but basketball, fantasy basketball, and Kevin Knox (more on him later) for 2018-19. So let’s get into the recent draftees and who they may compare to this upcoming year, giving us some pre-pre-preseason sleepers. So here we are. Time for those Dynasty Deep Dive rookie rankings that you have been clamoring for. The draft has come and gone and we now know the landing spots for those who had their names called out on draft night. In addition, many of the undrafted rookies were fortunate enough to find themselves a home as well. Remember that these rankings are for the entirety of a player’s career arc, not for 2018/19 redraft leagues. They are also representative of my own thoughts and not of anyone else at Razzball. We all have our personal biases and preferences in how we evaluate the long term future of NBA players. As always, I am happy to answer questions. Find me on Twitter @storytelling41.